Breakfast might be my favorite meal of the day. One reason is that the food options are just so dang yummy and varied. I’d argue that when you focus on health, a whole new world of breakfast possibilities are opened up because you have to get more creative than dumping cereal into a bowl or making pancakes from a box. Maca pancakes, turmeric omelettes, or matcha oats, anyone? Reason #2 is the actual act of making breakfast. Save for those mornings when you wake up late and are scrambling eggs in a hurry and are watching the clock tick and you can't find your thing and it’s just AHHH, making breakfast is usually a relaxing start to the day. Whereas dinner is rushed and swirling with thoughts of the day and the tasks still ahead, breakfast is a clean slate. You can set the tone for the kind of day you want to have. So MAKE IT AWESOME. You’d be surprised what an impact it might make on your day to simply try a new breakfast. Get out of your routine. In fact, I challenge you to declare one week of different breakfasts. Would it be more efficient to meal prep a batch of breakfast bars or something? Sure. I make this buckwheat breakfast bake all the time. But a week of fresh-made breakfasts is not only fun, it might lead to you finding a bunch of recipes you enjoy. 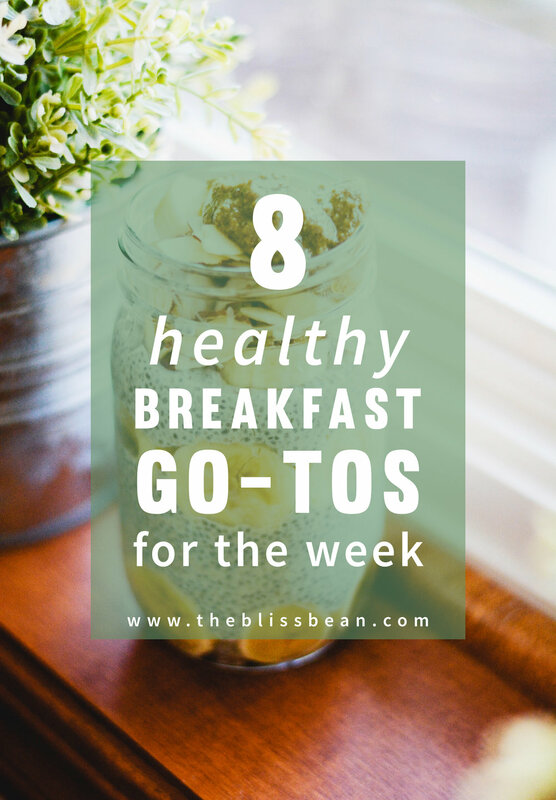 So without further ado, here are 7 ideas for relatively easy, totally yummy, and, of course, healthy breakfasts that you can (and should) make. I bet you’ve made plenty of smoothies already but their versatility and speed make them worth a mention. To add more nutrition, freeze up some produce like baked sweet potatoes, cauliflower, zucchini, and peas to sneak veggies into your breakfast. A handful of greens also never hurts. Avocados will make your smoothies insanely, irresistibly creamy. Pulse in cacao nibs at the end for extra crunch. Are you taking notes on all of this? Are you even a food Instagrammer if you haven’t ever dumped aforementioned smoothie into a bowl and topped with excessive toppings? Making a smoothie bowl will not only rack up the likes (guaranteed or your money back), but adding those yummy yummy toppings (granola, nuts, seeds, oh my) will prompt you to chew and initiate digestion, allowing you to absorb more nutrients from the smoothie. Plus, I’d venture to guess that taking the time to chew dat smoothie will make you appreciate its flavor all the more. Because you did NOT spend all that time carefully sprinkling hemp seeds and arranging banana slices just to gulp it all down in a hurry, right? TOPPINGS IDEAS: nut butter, banana slices, cubed mango, flax/chia/hemp seed, yogurt, pumpkin seeds, sunflower seeds, nuts, granola, toasted oats and other grains, coconut, chocolate sauce. I've also got a quick guide to 9 popular superfoods if you want to know why some of these are so awesome for you. My mom said her friend tried making chia pudding and described the sight upon opening her fridge as eyeballs in a jar. I hope you have a better experience with this amazing, food science-y breakfast, and don't let the texture and appearance deter you. Keep an open mind, okay? Some recipes call for blending the chia but I’d say that’s too much work and unnecessary dishwashing, so here’s an easy recipe from Eating Bird Food that doesn’t require that: Basic Chia Seed Pudding. When it comes to chia pudding, it’s really all about the toppings, so once you’ve got your base down, go crazy. Bananas, blueberries, walnuts, and almond butter taste amaaazing together. I know a lot of recipes make chia pudding overnight but I’ve totally made it on a whim before and had it gel up while I got ready for school and it was 100% a success. So never give up on your dreams. You can ALWAYS have chia pudding. I wonder if this sounds gross to someone who has never tried it but please please trust me when I tell you that it’s not. It’s actually quite spectacular. The idea is simple. Mash up a ripe banana, beat it with a few eggs, and cook exactly like you would scrambled eggs. BAM - sweet eggs. Hmm... that sounds like an exclamation of surprise. Oh sweet eggs! Let’s say that from now on instead of oh my gosh! Scramble over medium-high on coconut oil until cooked through. Barley is great. So is millet, and buckwheat, and quinoa. But, like, OATS. Ya know? Oats are somethin' else. Every time I come upon grossly overcooked, gelatinous, mushy oats, I am appalled. What a beautiful food, ruined. It should be a crime. Oatmeal is fast, has a perfect texture (in my opinion at least), and the flavor can’t be beaten. Use rolled oats for a balance between fast and nutritious (instant oats are the most processed and thus the least nutritious, while steel-cut oats take a loooong time to make). For a classic, top with almond butter, banana slices, and pecans, and mix it all together so that the banana and nuts get all nice and warm… drooling over here. Here are a few more ideas from the simple to the truly health nutty. I would say that omelettes are the savory cousin to smoothie bowls. They’re the kind of meal that can basically take anything you’ve got in the fridge. Leftover greens? Toss ‘em in the omelette. Sweet potatoes? Alrighty. Mushrooms? YES, please! Pancakes definitely do not have to be a time-consuming affair, especially if you’re cooking for one. It doesn’t get much faster than blender pancakes because it’s literally just one step beyond making a smoothie. And the payoff of this extra work is oh so worth it. Blend all ingredients together until smooth. Heat come coconut oil over medium-high. Cook pancakes, waiting for bubbles to appear before flipping. Makes ~1 serving. Blend all ingredients except poppy seeds until smooth. Add in poppy seeds and stir to combine. Heat some coconut oil over medium-high and cook pancakes. Makes ~1 serving. Toast may get a bad rap but that’s only cause most toast is made with that gross, white, styrofoam bread. There are so many better options out there. A personal favorite of mine is Angelic Bakehouse (pictured above). Food For Life Ezekiel bread is also pretty great. Honestly, once you get used to eating this kind of bread you can never go back. It’s just so much more FLAVORFUL. Plus, it holds up way better to toasting and toppings loading, so don’t hold back. You can go the savory route, with some classic mashed avocado, perhaps, or get a little crazier with hummus or miso. Sweet toasts are an obvious choice, and the sky’s the limit: nut butters, seeds, sliced bananas, berries, any fruit, really. Extra credit: make some FRENCH TOAST!